We have been prototyping new modes and play testing them. Here is a screenshot from about a week ago before Woody started working on making it look pretty. It looks a little dark but hopefully you can see what we're up to! 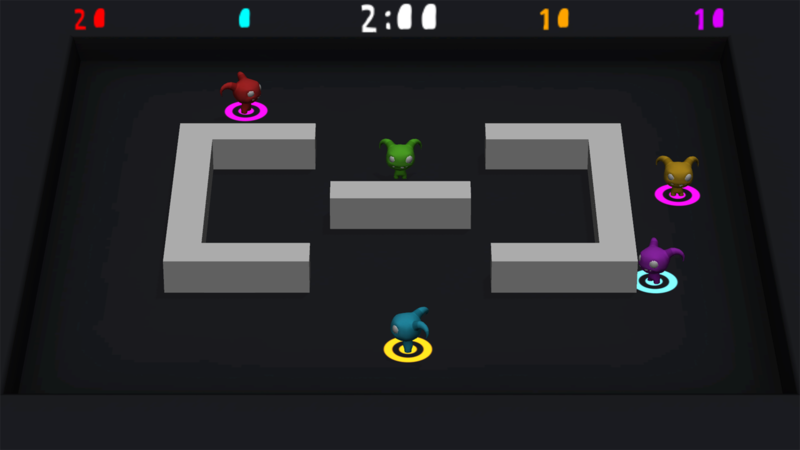 Apart from the standard battle mode which made up the classic game of Chompy Chomp Chomp we're playing with the rules & the colour change to see how much gameplay we can get out of it. Here are a couple of examples. One person is the dasher. They dash from safe zone to another to score points while everyone else is on their case. If someone chomps them then they become the dasher! 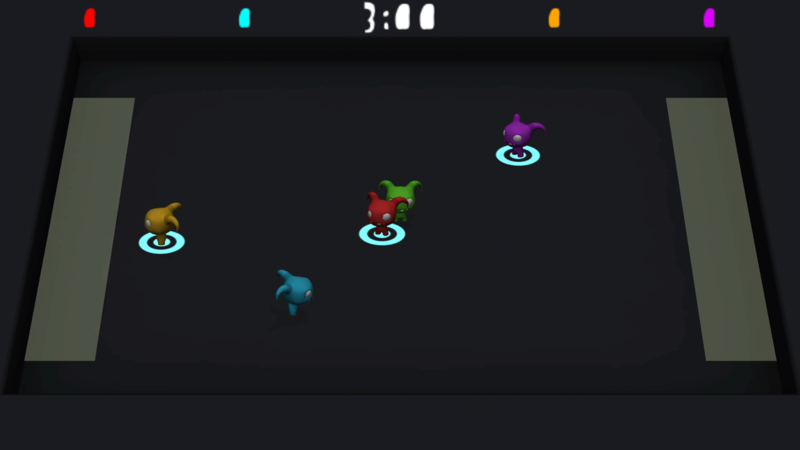 Here, blue chompy is running from one side to the other while everyone else has the blue target. When we play tested this it was supremely hard, particularly when there were a lot of players. We're going to try a few different things like have moving safe zones or put obstacles in the way. The basic game had people screaming so we know we're on the right track. Lots of balls fall from the sky, you have to turn them into your colour and chomp them. It's almost like a crazy Chompy version of Hungry Hippos. It's absolutely manic! We've been inspired by playground games and we're hoping to really get the joy of being a kid in a playground and running around like crazy. 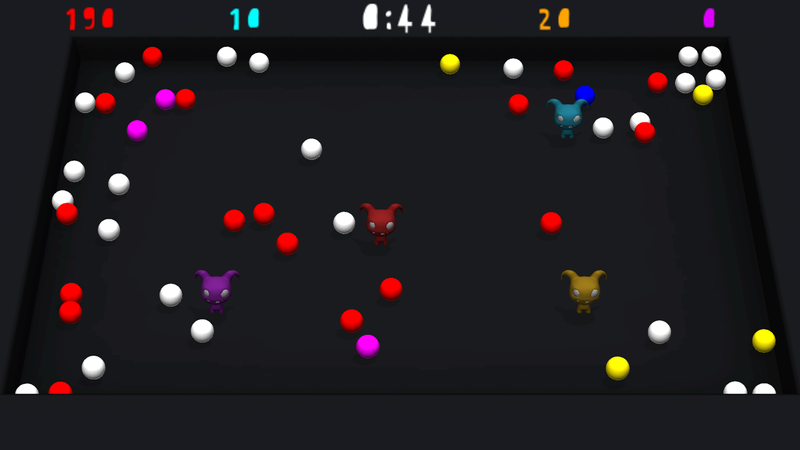 There's a couple of other modes we've made but they haven't quite passed the initial play test stage yet. If they aren't fun they aren't going in! Woody has also worked on the Chompy rig, Chompy idle, walk and run animations and has been using Unity mecanim to create blended animations. We also discovered and purchased Maya LT. It is the lite version of Maya that has been created especially for Indie game designers. It's cheaper and it doesn't include all the film bumpf that we don't really need to be paying for. The part that made Woody's eyes light up was the way it integrates with Unity. He also managed to rig the Chompy using a human rig. It was a bit of a challenge because it's so stumpy compared to an actual human but he managed it.
" It's lovely to be working fully in 3D rather than pre-rendered 2D. Also that Maya LT works very well in unison with Unity and the built-in texture baking tool Turtle is a really quick way to bake out lighting to multiple textures with a simple press of a button." In other news, We want next year to be the year of Chompy Parties. Seeing as we're fully self funding the development and marketing of this game are taking on external work for a couple of months to help fund all the parties. You might not get another dev post for a little while because we can't work on it full time. The good news is this will mean we should be able to afford to get to GDC 2014! Final update, we went to Telford this weekend to attend Insomnia 50. It was a really great experience. The indie zone was large and full of indies who we haven't had the chance to meet before, so we had a great time. There was a bunch of awesome indies that you can see on this link! We also got to show Chompy Chomp Chomp on the indie stage and we were interviewed by Fragradio.